Can I apply DR's Secret products around or near the eye area? Yes, most of DR's Secret products can be applied across the face including the eye area for most skin types. However, depending on your skin condition, putting on too much nutrients around the eye area may cause excessive burden to the delicate skin, which may promote the growth of fat granules. If you are suffering from such problems, refrain from using Moisturizer 6 around the eye area and switch to use products with lighter texture to avoid over-nourishment. Spot Serum 8 is suitable for troubled skin and should be applied on affected areas only. We strongly recommend the use of Aestier Eye Cream, which is specially formulated for your eye area. Are DR's Secret products suitable for all skin types, including sensitive or irritated skin? Yes, DR's Secret products are formulated for all skin types. Please refer to the DR's Secret Regime for recommendations to different skin conditions. It is good to note that different individuals have varying skin responses and reactions to different cosmetic ingredients. A good practice is to do a sensitivity test by applying the product at the back of your ear or the inside of your arm to detect any signs of reaction or allergy. This can help reduce the chance of irritation. Are Dr's Secret product safe to be used long term? Yes. Our range of skin care products are designed to cater to different skin conditions. Thus, users may enjoy using DR's Secret at all ages. Our products are specially formulated with a rich blend of botanical extracts to renew skin radiance and does not contain any drugs, steroids or hormones. Products are also regularly sent for extensive laboratory tests to ensure compliance to product safety. Please refer to DR's Secret Regime to help you achieve optimal results with long-term use. Individual results may vary depending on the skin condition. In general, you should see noticeable improvements approximately 1 month after consistent usage. As our skin cells require a timeframe to go through a renewal process, we encourage consistent use of the products for 3 to 6 months for more significant and ideal results. In the long run, you should be able to witness skin that is healthier and rejuvenated. I have a busy life and need to keep my routine simple. Which are the necessities that I should use? DR's Secret regimes are simple and easy to apply. Each regime will only take approximately 5-8 minutes to complete. Most importantly, you will enjoy this program when you see your skin improve every day! Depending on your skin needs, the recommended regime may vary, please refer to DR's Secret Regime. 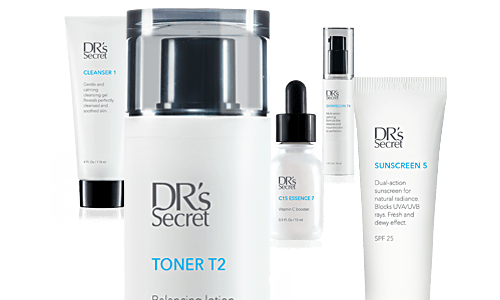 Is DR's Secret Touch and LIF suitable for all skin types? Yes, DR's Secret LIF is suitable for all skin types. Please make sure that you are using suitable products for your skin type and to use correct massage method. You can follow DR's Secret Regime and pair DR's Secret LIF with the products accordingly. If you have acne, please follow the regime and use only Blue Light to help kill bacteria and soothe inflamed skin. Use only a pause-and-hold method. Once then acne condition is improved, you can use other Modes with gliding method. Can I use DR's Secret LIF near my eye area? Yes you can. For any eye massage or treatment, apply eye cream evenly around eye area. Use B or L mode to massage eye area. You can use a gliding motion or pause-and-hold motion. Take care not to press too hard on your eye and not to shine the light directly into your eyes. If you have any eye conditions or went for any eye procedure or surgery, please do not use DR's Secret LIF in the meantime. You should recover completely before using DR's Secret LIF near your eyes. Can I use DR's Secret LIF and Touch if I have severe acne? Yes. For DR's Secret Touch, use only Cleansing Mode with gliding action. Remember to glide gently. For DR's Secret LIF, we recommend using Cleansing Mode for deep-cleansing to remove impurities. Glide gently to cleanse. You may also use Blue Light with a Pause-and-Hold method until acne severity is reduced. Can I use my own skin care products for DR's Secret Touch and LIF? Yes, you may use your skin care products as long as they are water-based. The products should also facilitate gliding motion. We recommend using DR's Secret and Aestier products. I feel a heating sensation in Heat Mode for DR's Secret LIF. Is that normal? Yes, the heat is generated from deep under your skin. It means that collagen production is happening, thus it is very normal to experience mild heat. Collagen production will help reduce saggy skin, wrinkles and fine lines. Can DR's Secret Touch and LIF be used on the neck? Yes you can. The skin on our neck is frequently neglected. For best results, use with a suitable product such as anti-ageing serum. For DR's Secret Touch, use Lifting, Vitamin C or Facial Mode. For DR's Secret LIF use V, B, L or Heat Mode. Use an upwards motion if you wish to have lifting effects. For lymphatic drainage, use a downwards motion on the neck. Move downwards from the neck to the chest and to the armpits. I feel some tingling sensations on my skin when using DR's Secret Touch and LIF. Is that normal? It is normal to feel tingling sensations. However to prevent this from happening, always ensure that you apply sufficient skin care products and that the massage head is always in full contact with your face. Can I use DR's Secret Touch and LIF on my scalp and body? Yes you can. For DR's Secret Touch, use Facial Mode of general massage. For lifting and firming purposes, use Lifting Mode. For acupoint massage, use Eye-Zone Mode or Vitamin C Mode. For DR's Secret LIF, use V or B Mode to help increase skin care absorption, or L or Heat Mode for skin firmness. As DR's Secret Touch and LIF was customised for face use, you may find that it may not be as effective when used on the scalp or body. Are there any UV rays emitted? No, there are no UV rays emitted. Our products have undergone vigorous testing to ensure that no UV rays or radiation are emitted. Can I wash DR's Secret Touch and LIF under running water? No. Washing the devices under running water will cause damage to the device. Clean the massage head with wet tissue and leave to air dry. You may also use dry tissue to wipe it dry. Alternatively, you may use disinfectant wipes to clean the massage head. Take extra care when cleaning the grooves of the massage head. My DR's Secret Touch and LIF titanium head looks rusty and corroded. The titanium head of DR's Secret Touch and LIF is made of inert titanium and it will not react with other materials. Do not scrub the metal head with any metal scrub or use harsh detergent on it. By doing so, you are removing the inert material and exposing the device to wear and tear. Clean the massage head gently with wet and dry tissue, taking extra care when cleaning the grooves of the massage head. Is the massage head hypoallergenic? Yes, the massage head is made from high density material and titanium poles and is safe for all skin types. How long do I have to use DR's Secret Touch or LIF before I see results? It depends on your skin type and how severe are your skin concerns. For users with normal skin or mild concerns, you may see results in a few sessions. For users with severe skin concerns, it will take more treatments to see results. 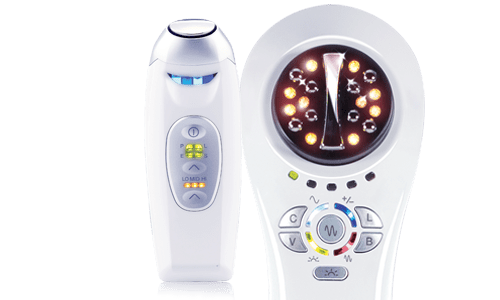 Can I use DR's Secret Touch or LIF if I am pregnant or am fitted with a medical device? If you are pregnant or suspect yourself to be pregnant, please consult your physician before using DR's Secret Touch or LIF. If you have a cardiac problem or are fitted with any form of medical device, please also consult your physician before use. My DR's Secret Touch and LIF are not charging. The charging display on DR's Secret Touch charging dock should be lighted up during charging. If not, check that the charging terminals are free from dust and dirt. Clean with cotton buds if needed. For DR's Secret LIF, charging will occur even if the device is switched off. Switch on the power button to check the battery status. If you are using the charging dock, the charging display will light up.